Welcome to Castlebar rugby Club. We hope that you enjoy us as hosts, please if there is anything you need to question of us throughout the tournament, do not hesitate, or shy away, our main aim is that you enjoy this event. Safety is a priority and we hope all players should remain injury free, to ensure this all teams should warm up before tip off, arrive early to give your team enough time to stretch and limber up, if you need help with this just ask. We have no problems giving you a demonstration of a comprehensive warm up. Ensure that all players are jewellery free. Lock all valuables away safely. All clothing to be tucked in to avoid finger injuries. The hooter will sound 1 minute before tip off, all players should use this time to tag in for the game. The second hoot will sound and play is on. At the end of the match all players will de-tag on the half way line, leaving tags ready for the next team. Abuse toward referees will not be tolerated, all officials are voluntary, giving up free time for your enjoyment, so show respect, there are yellow and red cards in these games and officials are instructed to use these when needed. Full Changing and shower facilities are available at the grounds for both men and ladies with refreshments available during and after the games. The referee�s word is final, Please refrain from questioning his or her decisions. POINTS: Teams will receive 5 points for a win, 3 for a draw, 1 for a loss, and none for a forfeit. PLAY OFFS: At the completion of the round robin, the Final Series commences. Prizes will be awarded to the Winners and Runners-up on Finals Day. Players must have played & signed-on for three or more games to be eligible for the play offs. DRAWN GAMES: Should two teams end up with equal points after the round-robin stage, points "For and against" will apply. Should a team be on equal points and the "For and against" difference is equal the team with the highest "For" score will secure the higher place. For drawn games in the quarterfinals, semi-finals and finals the "Golden Try" rule will apply. The first team to score a try wins. However, if the receiving team scores in the first set of 6 rags, the opposition then have 1 set of 6 to score a try of equal or more points (i.e. a female try if the other team score a male try), otherwise first try wins. LATE ARRIVAL: To ensure that the competition runs on schedule all teams should be ready for their game 5 minutes prior to kick-off. Teams arriving more than 7 minutes late will automatically forfeit the match. 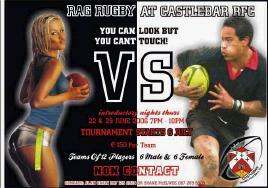 FORFEITS: If you have to forfeit a game, please contact the Castlebar RFC Rag Rugby committee by 1pm on the day of play. If you forfeit twice without notifying the committee your team will be withdrawn from the competition with no refund and your place will be made a bye for the remaining rounds of the competition. There will be no exception to this rule and we encourage all teams to make every effort to play at your scheduled time slot every week. Contact/ hand-off�s are not allowed. This is a non contact sport and will be punished by a penalty and/or yellow card. Direct running i.e straight running into a player is not allowed and will be punished by a penalty and/or yellow card. Players must make sure that they are properly warmed up to avoid injuries. If you are unsure about warm ups, then any member of the club will gladly help. POINTS: Teams will receive 3 points for a win, 2 for a draw, 1 for a loss, and none for a forfeit. PLAY OFFS: At the completion of the round robin, the finals night commences on the 10th of August. Prizes will be awarded to the Winners on Finals night. Teams must have played & signed-on for three or more games to be eligible for the play offs. DRAWN GAMES: Should two teams end up with equal points after the round-robin stage, Tries scored will apply. Should a team be on equal points and the "For and against" difference is equal the team with the highest "For" score will secure the higher place. For drawn games in the quarterfinals, semi-finals and finals the "Golden Try" rule will apply. The first team to score a try wins. However, if the receiving team scores in the first set of 6 rags, the opposition then have 1 set of 6 to score a try of equal or more points (i.e. a female try if the other team score a male try), otherwise first try wins.